What Makes A Net Zero Energy Building? Amidst growing concerns about rising energy prices and the impact of climate change, it is important to know that buildings in Singapore constitute to high energy consumption year on year. This fact underpins the significance of targeting building energy use as a key to decreasing the nation’s energy consumption. Urban builders can reduce energy use by incorporating passive and active energy-efficient strategies into the design, construction, and operation of new buildings, and undertaking retrofits to improve the efficiency of existing buildings. 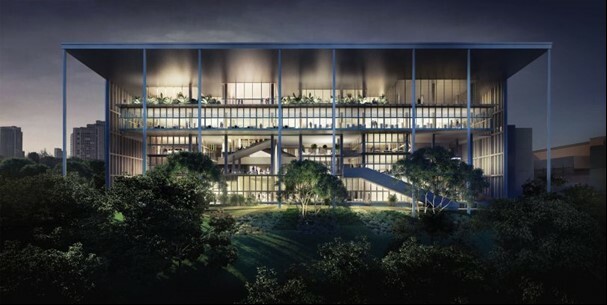 Artist impression of the tallest Net Zero Energy Building in Singapore – NUS School of Design & Environment (NUS SDE4). Currently, the most challenging energy-efficient strategy is designing a Net Zero Energy Building (NZEB), which produces as much energy as it uses over the course of a year. There are several definitions for NZEB, and the most commonly defined term requires renewable energy generated from its own building footprint. With advances in energy efficient system, construction technologies, and renewable energy systems, creating NZEB in our environment is fast becoming more feasible. In Singapore, we are well connected and enjoy high grid stability. An NZEB is also connected to the electric grid, allowing the electricity produced from traditional energy sources (natural gas, electric, etc) to be used when renewable energy generation cannot meet the building’s energy load during low production season. On the contrary, when on-site energy generation exceeds the building’s energy requirements, surplus energy should be exported back to the utility grid. The target is to achieve net zero over a year. Achieving a net zero building with today’s technologies and meeting occupants’ expectations can be challenging. In Singapore, high demand in air conditioning systems makes it even more difficult. With limited roof space, a low rise building on a low-density site have a better chance of being net zero with onsite renewables, compared to a high rise / high density area. Since NZEB is calculated based on energy consumption, the mode of operation is as critical as the design strategy, hence the success of the NZEB also depends heavily on the client’s involvement and cooperation. Every equipment that consumes energy from the building must be counted and monitored. The latest, and by far tallest NZEB in Singapore is the 4th building in NUS School of Design & Environment (NUS SDE4). The programme spaces are predominantly air conditioned. The architectural design of the NUS SDE4 is a joint effort between Surbana Jurong Pte Ltd, Serie Architects and Multiply Architects. With a sprawling gross floor area of 8,500m², the six-story building will accommodate labs, design studios and workshops for the school of architecture, interior, landscape and product design. Appointed as the Energy & Climate consultant, Transsolar Energietechnik GmbH provides guidance to the design team in creating an energy-efficient building with simulated tools for thermal comfort, daylight & glare protection, and energy saving – all these, comes with tools for measuring effectiveness. This NZEB not only has the ability to meet its own energy needs for the next 20 years, it will also generate an energy surplus in the first 10 years. Solar Panels on Rooftop of NUS SDE4. The architectural design of the NUS SDE4 begins with maximizing passive design, yet reducing energy consumption from the grid. This results in the final construction of a large over-hanging roof to shade the interior from the scorching tropical sun, while its porous layout allows for cross ventilation for a comfortable environment – with minimal reliance on air conditioning. The effective integration of the roof and outdoor spaces, harnessing solar energy with a hybrid cooling approach, provides for natural ventilation, and at the same time, optimises lighting and energy use for the building. NZEBs often have extremely high requirements in the active design aspects. Not only do they need to be operationally optimal and meet the standards in equipment design, they also need to challenge the norms of traditional designs. In the case of NUS SDE4, our designers stood up to the test of re-designing the traditional air conditioning system. NUS SDE4 is also a building with smart features. The windows of lecture rooms are equipped with sensors, that will trigger the system to switch off the air conditioning system when the windows are opened. Incorporating the most advanced equipment and concept, NUS SDE4 is aimed at providing an excellent foundation and platform to fulfill the goal of zero and low energy consumption, as Singapore continues to push the boundaries of sustainable design in building a green and resilient urban environment for everyone to enjoy. The windows of lecture rooms in NUS SDE4 are equipped with sensors, that will trigger the system to switch off the air conditioning system when the windows are opened. The NUS SDE4 will indeed pave way for the design and build sector’s drive towards energy-efficient buildings for a sustainable future. It is a perfect example of true design integration with strong client’s involvement and commitment. The secret recipe to the success of this project lies in the ability to challenge conventional designs, such as the hybrid system introduced to take the conventional air conditioning system to task. 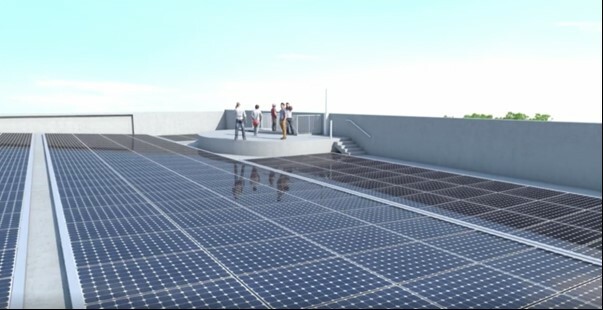 If proven to be successful in the long run, it may very well be implemented for subsequent projects which garner greater savings, consumes extremely low energy, or even net zero energy, such as the cited example of NUS SDE4. While building heights and mode of operations remain highest in terms of challenges in achieving NZEB, the industry should continue exploring new features and implement innovations in the design. After all, one small step taken for a single project, is one giant leap for the building industry. This article is co-created by Surbana Jurong Academy. Copyright © 2019 Surbana Jurong Private Limited.